For Practicing: dual pallets AND a set of cheap old pan paints too! The day started hot and humid as it has this summer (a verdant August is unheard of here in Middle Tennessee, but it’s true this year …) so I grabbed the happy tails duo and we headed to the park for a pre-sweltering distance walk. Once home, I thankfully grabbed my coffee, and laid out my stuff to paint with Pandora playing random tunes in the background to inspire me. 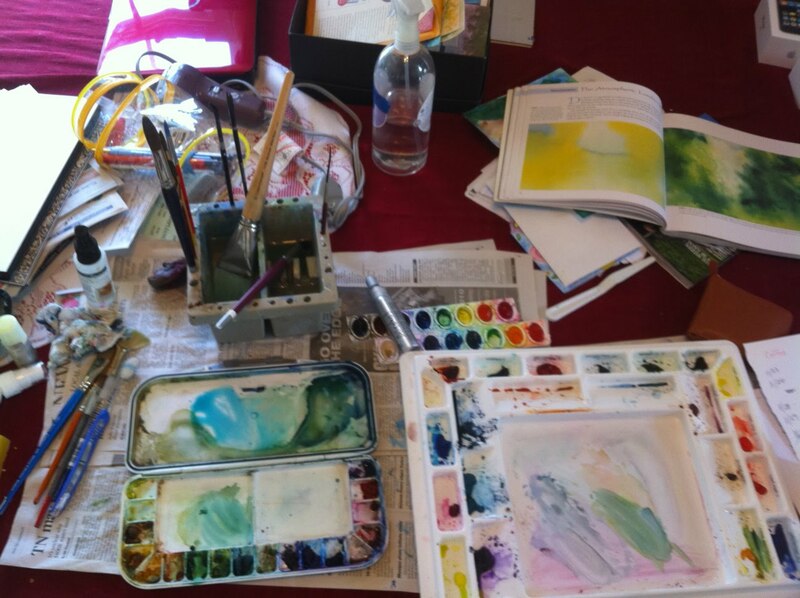 I didn’t need it however, because I found the perfect inspiration in The Tao of Watercolor: A revolutionary approach to the practice of painting by Jeanne Carbonetti. One of the several library books I checked out yesterday, this one beckoned me. The thing I’ve learned over the past year is that you have to give up control in watercolor more than any other medium. You have to relinquish planning and organization, for the most part, in order to achieve the most breathtaking works. Carbonetti’s book illustrates this beautifully as she explains washes that go far beyond the flat, graduated, etc. and gives you room to breathe, play, and explore. I would elaborate but want to get back to my work now the paint layer’s dry. You’ll have to check it out yourself. One final note, though, I noticed she has several other books entwining eastern philosophy and painting. This entry was posted in art education, watercolor and tagged art books, jeanne carbonetti, the Tao of Watercolor. Bookmark the permalink. >You talked me into buying this book. Thanks for the nudge.